The past couple weeks have been so hectic and has flew by so quick that I ended up getting behind on EVERYTHING!!!! No joke! To top off my hectic couple weeks...... 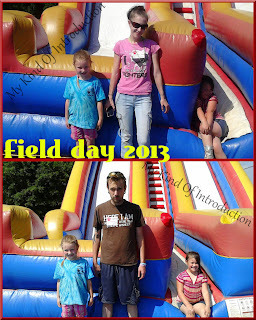 I sick all day Tuesday and yesterday was Field Day at the girls' school so Alan and I were volunteers. 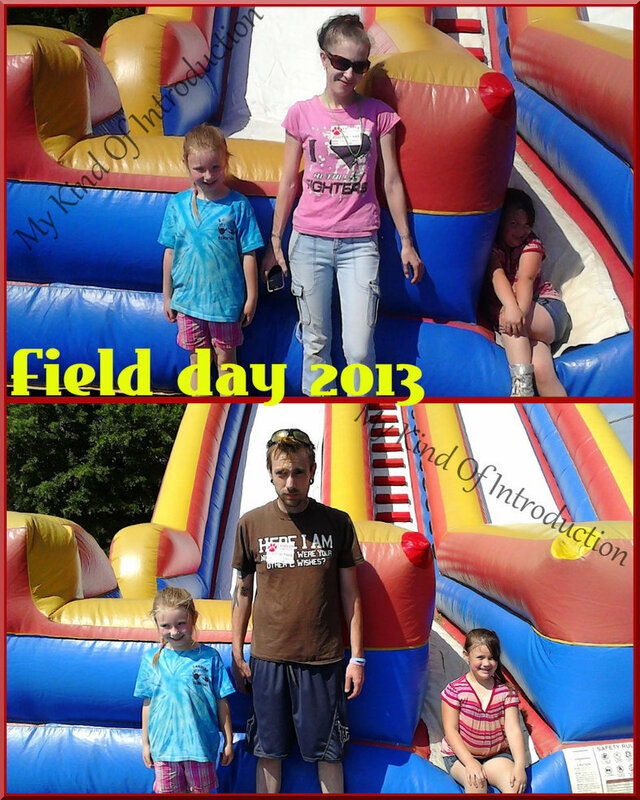 It was very hot and hectic but we had a BLAST helping out with Field Day. Alan and I helped out last year during Loran's first field day and I am sooo glad that we were able to help out this year as well, for Jade's first Field Day. I know so many of the kids in that school, a few are family, I enjoyed getting to see everyone and I got alot of pretty good pictures. My camera decided that it wasn't going to read my SIMs card this morning and I don't know if that means my card is messed up of my camera because I had just had my card hooked up to my computer before we left the house so I knew the card was working. So I ended up getting pretty upset but decided that I was going to try my best to take as many good pictures that I could with my phone, crossing my fingers that my phone wouldn't die on me now as well.... My phone is a whole different story..... Long story short -- I dropped my phone in my bath the other night and it bubbled! It has been in and out of a bowl of rice for a day or 2 and it made me proud today!!!!! It may have been messing up pretty bad when it first happened but it works now and I am VERY grateful. I would of been very upset if I wouldn't of been able to take pictures of the girls yesterday. I have many pictures from last year, I needed pictures from this year too! And I got them! You truly don't realize how happy I am about those photos, unless you know me and how I am about Photography and memories. I don't only take pictures of my girls when I'm at their school. I take pictures of every child that I know, especially if their parents wasn't able to make it. I try to make sure that everyone has atleast one picture of their child from the events that I attend. Memories and Photos are all we're going to have of our kids being little, once they grow up. It happens so fast! That's why I do my best to capture as many memories as I can, for everyone that I care about as well as myself. I want to say Thank You, because if you read the whole post then that says to me that your a true follower of mine and that warms my heart. You are awesome! My random rant is complete. Learn to make your own Mobil App Plus much MORE! Learn to build websites, create iPhone and Android apps, code with Ruby on Rails and PHP, or start a business - LEARN MORE at TeamTreehouse! Do you struggle when it comes to technology and getting a business started? Have you even dreamed of making your own Mobil App? Take yourself on a Learning Adventure with TeamTreehouse to build a blog on the WordPress platform! You'll start off by learning to create a simple website using HTML and CSS (the basic building blocks of any website) Then, you'll learn how to install and setup WordPress; manage content and comments; and customize the design and functionality of a blog. TeamTreehouse.com is used by thousands of people to learn web design, coding, mobile app development, how to start a business and more! Treehouse offers a 30-day money back guarantee. Need more convincing? Watch the video below to see what you can learn! As parents, CEO, David Scheinberg, and VP of Product Development, Lisa Medora, established MFS Eyewear after recognizing the tremendous gap in available eye protection in today’s consumer markets. Unlike most competitive brands, David and Lisa devised a company with a corporate mission focused exclusively on the design and development of reliable yet fun eye wear for children. Real Kids Shades is currently working closely with Prevent Blindness America to educate the public on the importance of protecting children’s eyes. By advocating sun safety through their Safe Eyes Everyday program, Real Kids Shades helps parents provide serious sun protection for babies, toddlers, and kids up to age 12. All Real Kids Shades provide comfort, durability, and safety. Their rigorous product testing program assures all Real Kids Shades are CPSIA Compliant, CE Certified, and FDA Approved to provide 100% UVA and UVB protection. 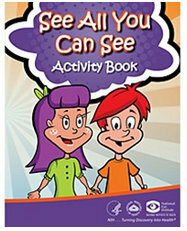 For More Information: Visit the Real Kids Shades Website, connect with them on Facebook and follow them on Twitter and Pinterest. About the Giveaway: This giveaway begins on 5/29 at 8pm EST and ends on 6/13 at 12:00am EST and is open to US and Canada ages 18+. Please refer to the full terms and conditions in the Giveaway Tools. Back in September, my daughters and I decided to make Butterfly Wall Art and I shared the craft with you. About a week ago, I got the most wonderful opportunity to be a part of a small group of bloggers that got to test out a program that allows me to group up the supplies needed for a project into a basket for you to purchase! The program is called Mystikit. You can choose which ever items you do and do not want to buy, all those options are up to you!! Everything is purchased through Amazon.com which is wonderful since almost everyone buys from Amazon atleast once in their lifetime! The process is very simple and it makes things easier than having to make a shopping list and head out to the store. I will be using Mystikit with all my Crafts and DIY projects along with recipe posts (for food and natural-household) It will take me a few weeks to get all the Mystikits made for the Crafts that I've already posted but a few of them have already been updated. I will make a list of crafts that have a Mystikit made for it, at the bottom of this post. 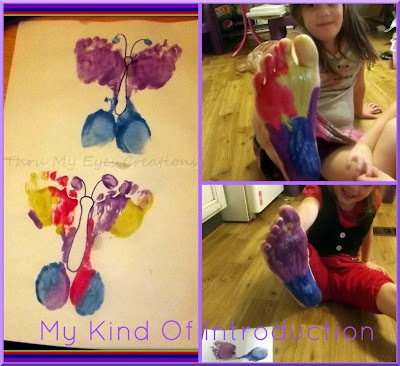 Start by painting your child's foot. It can be just 1 color or a mix of many colors. When your finished painting the foot, stamp the left foot on the RIGHT side (right wing) of the paper and the right foot near the other foot stamp but on the LEFT side (left wing). Use a permanent marker to draw the body, head and antennas. 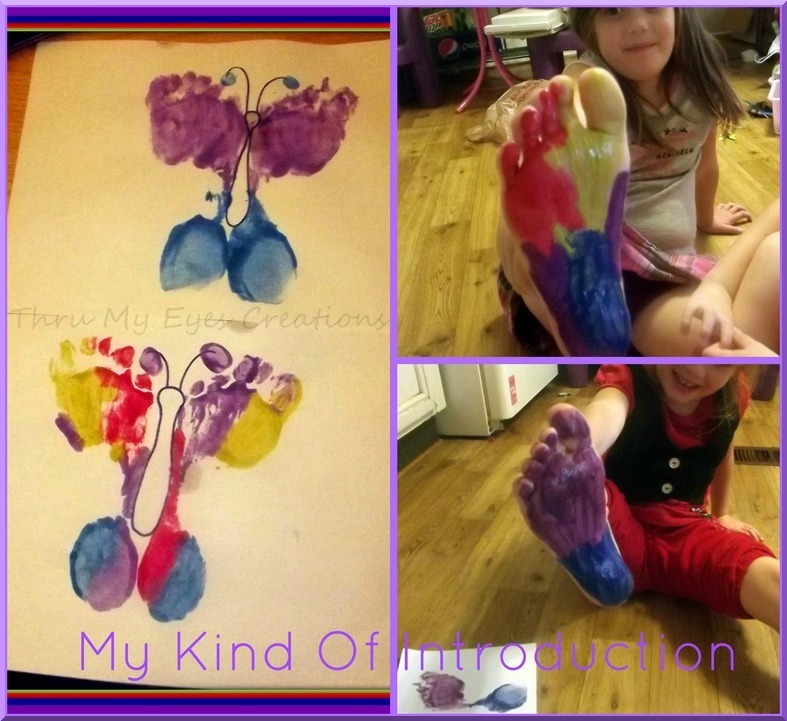 My daughters had a BLAST painting each others feet and making their own Wall Art! It was great family time spent with my daughters and we plan on making more butterflies real soon! 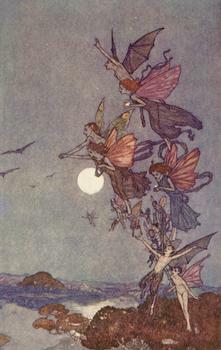 Mermaids and Faeries -- Fact or Fable? Warning -- This post is full of strong opinions that may be very different than your own. All opinions are my own, I was NOT influenced by anything or anyone. I am not trying to disrespect anyone or their beliefs. I'm just simply stating my opinions on the topics below. Have you ever wondered how we became the way we are? Why is our skin smooth? Why do we only have hair growing on certain parts of our bodies? Why is there a type of webbing between our fingers and toes... Some more than others? How can some people be GREAT tree climbers and others can't even make it off the ground? Did we slowly transform into the people we are today from Apes? Did some of those apes go into the water and turn into what we know today as Mermaids? I wasn't able to watch the Animal Planet movie that was on TV this past Sunday, I completely forgot that it was on TV but I was able to watch the first documentary that came out before Sunday's viewing - Mermaids: The Body Found. (I found it on YouTube, it's in different parts but I was able to find a playlist that had the whole movie in order so all I had to do was sit back and watch.) If you would like to view Mermaids: The Body Found, the links you will find in this post are to the playlist that I was able to find on YouTube. I want to warn you that there are 9 parts and all together they last over an hour. But if you are into Mermaids or Science, then you won't be disappointed. 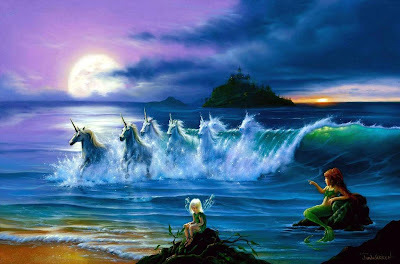 Many believe that the stories of these unknown beings are myths. But if they are in fact fake then why has they're been many stories from people all over the world, who have had no contact with each other, all talking and drawing about the same beings?! Something in the water that is half human and half fish, tiny people who live in caves and in the forests and hills of MANY different lands on this earth. 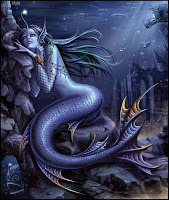 People have been mentioning mermaids and faeries in their writings and drawings since the beginning of time! You can do an internet search and find MANY photos and articles about the mythic beings that have been talked about for ever! They're has been draws found on the walls of caves, crumbling transcripts full of stories and drawings of mermaids and the fae, along with many more animals and creatures; some identified and some not. Who says that all of this is fake? Because there is no proof of a living mermaid or a faerie or a tiny human that lives in underground caves and call themselves hobs.... They do not exist! We have continuously been discovering new species of animals, insects and marine life throughout many years, up to this year! 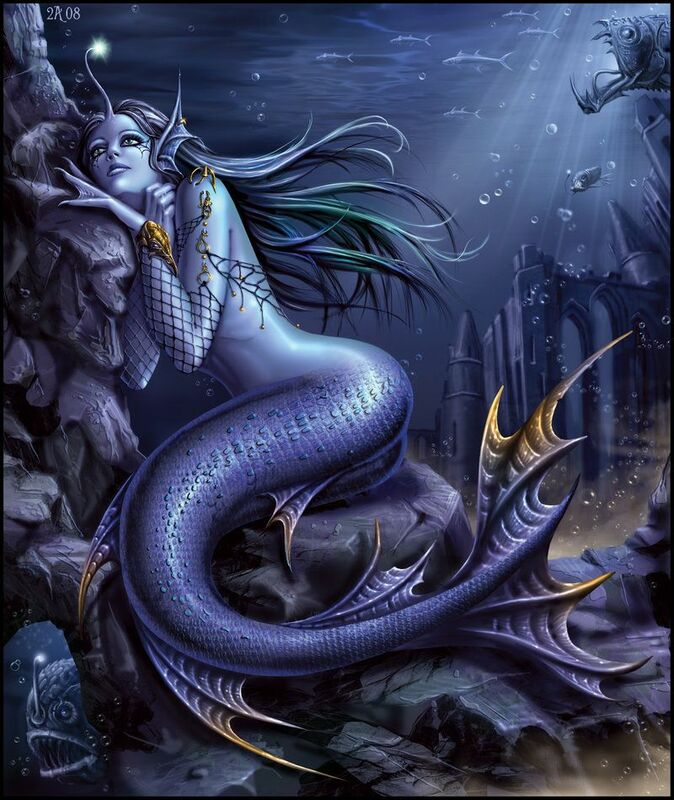 If a giant squid can stay hidden in the ocean for millions of years, why can't mermaids? If there are many different types of animals then how can humans be the only mammal that is smart enough to walk upright and live the way we do? I personal believe that there are other "people" that are just as smart as humans, maybe a bit smarter, that know how to live off the land, make weapons and who have big brains that can do wonderful things, like ours can. We are not superior to all these creatures. What makes us so special? We are all to believe that when we die, our souls go to Heaven and we meet our Lord and Savior, Jesus Christ. Not to be controversial and start arguments but... Where is our proof? The Bible. Written words found many years ago. What I'm trying to say is that no one really knows what's out there. No one really knows if we came from apes, turned to mermaids, ended up humans, or if was it something else that brought us here completely No one knows because we wasn't alive back then and couldn't see it with our own eyes. It's all just a "he say - she say" ordeal and it has been known to make alot of people mad at each other. I do NOT want to make anyone mad. I just have a very strong opinion about some things. If I sit and truly think something out and break it down in my head.... I end up thinking too hard and can get into a debate with my fiance. Do you believe in Mermaids and Faeries? Disclaimer: All opinions expressed above are my own and may/will differ from your own. I have been influenced by no one and/or anything. I understand that some opinions mentioned above could be taken wrong and I am responsible for everything I have said. I am NOT meaning to disrespect anyone else, their beliefs or way of life, I am simply voicing my personal opinions and thoughts. When it comes to being active, my fiance and I are completely different. When I am able to get out, I'm a runner and a walker while Alan is more into MMA (mixed martial arts) and other similar training. We got the opportunity to try out an AT Surgical Ankle Brace that is made to give extra strength if you have weak ankles or calves. They are available in Small, Medium, Large and Extra Large; we chose the Medium since it was said to be 9 to 10 inches in length. I figured my fiance and I could both be able to wear it, their is a big difference in out feet size but it was worth a try. Alan decided he wanted to try it out first while he was doing a little training with a neighbor. He said that he liked the way it fit it ankle and ended up wearing it to work that night as well. Alan said the that the ankle that the AT Surgical Ankle Brace was on, that foot didn't hurt as bad as normal. Quiet a surprise! 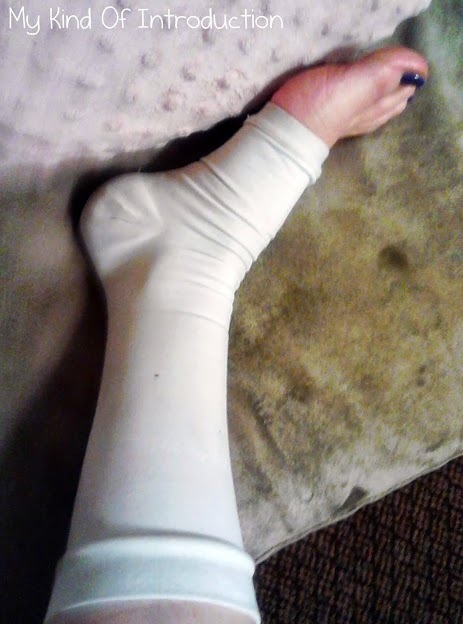 A couple days later, I was heading out for a run and I figured I would see if the AT Surgical Ankle Brace would fit me. IT DID!!!! I slid it on and it was very comfy and tight. Out for my run I went! I ran my normal distance down my road and back and could really tell the difference in support my ankles had. The one with the brace felt tighter and not as sore. What all is the AT Surgical Ankle Brace made for? Additional strength and support for weak ankles and calves. Provides the right amount of sustained pressure around delicate joints. You can purchase the AT Surgical Ankle Brace for less than $12.00 plus s&h and it comes in White or Beige. We chose White. Over all, we really enjoyed our experience with the AT Surgical Ankle Brace and would recommend the AT Surgical Company to anyone looking for any type of body supports from head to toe, they have what you need! While visiting their site, I saw a Tummy Belt for pregnant women!! It's made to give the extra support they need for their back and belly. The Tummy Belts are available in Light, Medium and Heavy Duty Support strength plus there are many different designs that are made to relieve different areas on the pregnant woman. The AT Surgical site is out of service at the moment. Several years ago the ladies at theprincessdress.com were looking for dress up clothes for a little princess who needs a new wardrobe and became frustrated with the lack of options in their city. So, they decided to open their store online so no matter where you live you can create the ultimate dress up wardrobe for your princess!! It's their mission to make little girls' dress-up dreams come true! They use a variety of manufacturers to provide a good selection of products so you can find just what you're looking for! About the Giveaway: This giveaway begins on 5/25 at 8pm EST and ends on 6/8 at 12:00pm EST and is open to US residents ages 18+. The Prize: One lucky winner will receive a $30 gift certificate to ThePrincessDress.com PLUS free shipping Up to a $40 value! This is the giveaway EVERYONE has been waiting on!!!! Perfect for the kids who want more then just a backyard pool, and it can be used inside when it rains or even all winter (it's just 6 feet high and will fit in most rooms or in the basement of any house). 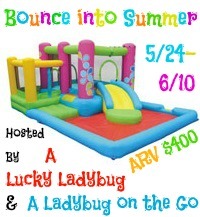 Who doesn't want their very own Bounce house??? "Make Our Own Network" solely organized this event and I received no compensation for this publication. My opinions are 100% my own and may differ from your own or even those stated in this post. My Kind Of Introduction is not responsible for sponsor prize shipment. Disclaimer: NO PURCHASE NECESSARY to enter The participating bloggers were not compensated for this post. We are not associated with any of the companies named above. Void where prohibited by law. This letter that I received in an email this morning that made my daughter's day!! Madeline and her friends want to wish you a Happy Birthday - congratulations on being six years old! Tea Collection is having a HUGE Memorial Day Sale!!! From May 24th through May 27th, Tea Collection is offering $15 Girls Dresses, $12 Girls Leggings and $12 Boys Tops. Get great prices on all kinds of comfy shirts for boys! You can also mix and match the cutest leggings and dresses for the little girls. This is an awesome sale that you don't want to miss out on!! Stock up on your kids' summer wear with Tea Collection!! It really is amazing when you realize how small this world is! My Kind Of Introduction may receive products or other ways of compensation for selected posts. I received a free printable PDF file in return for this review. All opinions are my own and I always promise to be honest. I only bring you products and/or services that I believe my readers would benefit from and or enjoy. If you like connecting with brands and getting the chance to sample products for free then you need to check out Smiley360. I'm working on my second mission and I couldn't be happier! The mission I am in the process of completing is for Centrum Flavor Burst Multivitamin Chews, but that is not what I'm going to talk to you about this morning. I want to let you know what it's like when you first sign up with Smiley360. If your thinking that you have to be a blogger to be a Smiley360 member... Your wrong. All you have to have is a Facebook and Twitter account. Having a blog is just a bonus. The whole idea of Smiley360 is for you to be able to connect with your favorite brands and for the bands to put their products into the hands of people who will brag about them to their friends. What better way to let people know about your products then to give a few away to top influensers (explanation of the word at bottom of post) that will share their thoughts will all their friends. The best was to advertise is by way of mouth! What happens when you tell a juicy secret to a girl who loves gossip? She runs to her friends to make sure she's the one who spreads the news first! That's what brands want! For us to spread their juicy secrets all over town! I was very surprised when I received my first mission for Smiley360. The Flat Smiley was a very cute idea and my daughters thought it was the coolest thing ever! As soon as I got my Mission Kit, I printed out Flat Smiley, Cut it out, Backed it with cardboard from a cereal box (so it wasn't so flimsy) and then started having some fun. 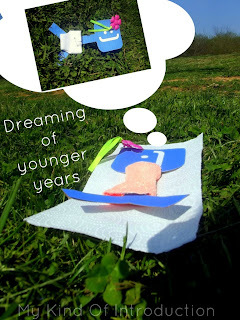 My daughters decided that Flat Smiley is a girl so we gave her a bow, took her outside to play, she laid out in the sun, dreamed about younger days and even slipped on a silk gown and had a "girls-night slumber party" with my daughters. Flat Smiley is a wonderful choice for my first mission for a new network! My family had a blast playing around with Miss Flat Smiley and couldn't of asked for a better first Smiley360 Mission! If your interested in joining Smiley360, click the link in this text and start connecting with your favorite brands today! Influensers - People who have a community of followers like Facebook/Twitter fans and/or friends along with face-to-face connections who they enjoy sharing their thoughts about awesome products with. The National Eye Institute has all kinds of FREE fact sheets about eye health available on their website! Most of them are downloadable but a few you can get mailed to your home. The information is very interesting and can really help someone who is either going to school in that field or is just wanting to learn. They even have a workbook for kids! Get your Eye Health Fact Sheets and keep those eyes healthy! The best learning experience I've had so far this year! Disclosure -- I received free admission to The Blog Workshop in return for the following review. Even though compensation was received (in form of free admission), my honest opinion is always my own and can never be altered or steered in any way. This past weekend I was lucky enough to be able to attend The Blog Workshop Online Conference and I couldn't be happier! This was my first blog conference and I wasn't really sure what to expect but I can say that The Blog Workshop rose WAY above my expectations. I learned so much from The Blog Workshop that I don't even know where to start! I do know that I have a few things that need to be changed and I'll be making a To-Do List very soon!! Everyone was tweeting throughout the whole conference with the hashtag #TBWC13 and we ended up Trending all 3 nights!!! How awesome is that?!? That stands for something, right?!? A Great Example that shows AMAZING things can and will happen when you get a group of wonderful bloggers and vloggers together! Take note Brands! We are no longer just simply bloggers... We are Influensers with a community of followers who love us! I couldn't be happier with my 1st conference experience! Da Vinci, the girl in control of The Blog Workshop (no joke, Da Vinci did not disappoint, she ran that conference like a champ! ), is a super awesome lady! She runs the blog Your Life After 25 and I had no idea how laid back and fun she was! 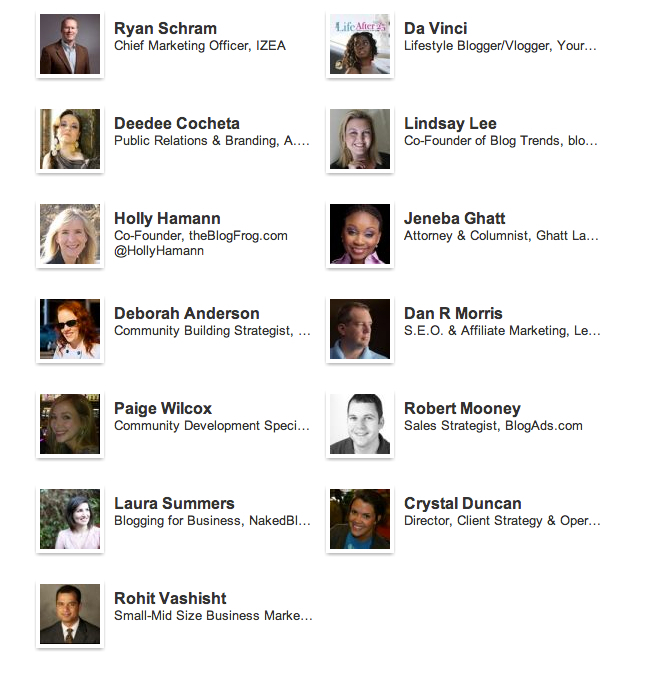 Along with all of the other speakers at the conference as well! Everyone was joking around, having fun, learning and teaching! I was even able to learn a good bit from the chat box throughout the conference from all the other attendee's! It was wonderful! 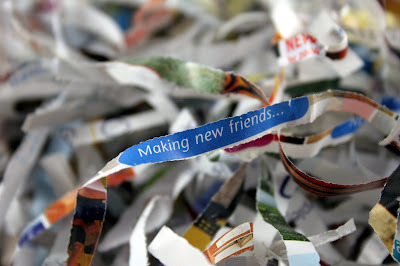 I made so many new connections and I can't wait to see what all these new blogger buddies and learning tools can do for my blog, my business and my future! I can't wait for 2014! 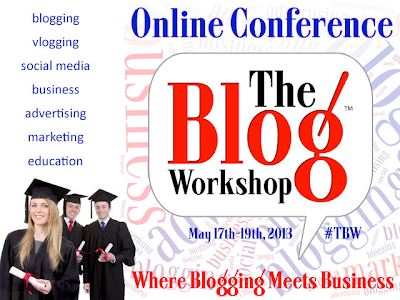 If your thinking about attending a conference next year than I recommend looking into The Blog Workshop. A year sounds like a long time but everyone needs time for some planning don't they? Oh yeah, and I am almost 100% sure that next year the conference is going to be 10x better then this year... if that is even possible because #TBWC13 was AMAZING!!!!! Keep an eye out for ALOT of changes in the future because I'm following the yellow brick road to success!! To - @rafflecopter @bighoncho @cloudswipe @mysubjekt @legalzoom @socialwebcafe - THANK YOU for sponsoring @theblogworkshop #TBWC13 Ur GREAT! Take a look at the collage that Da Vinci made up of some of the photo's we were tweeting of us hanging out with The Blog Workshop!! I'M IN THE COLLAGE...... I'm wearing a green shirt... Can you find me? Just Moved or Planning on Moving soon? LegoLand Coupons in Lego Club Magazine!